1. Visually inspect for broken or cracked Lock Tabs (1), cracked or missing Leg Hooks (2), broken or bent Feet (3), broken Spring Pins (4), bent Outer (upper) Leg Section (5), or Inner (lower) Leg Section (6), and cracks in Yoke (7) or Pivot (8). 2. Inspect for spring tension on Latch (9). 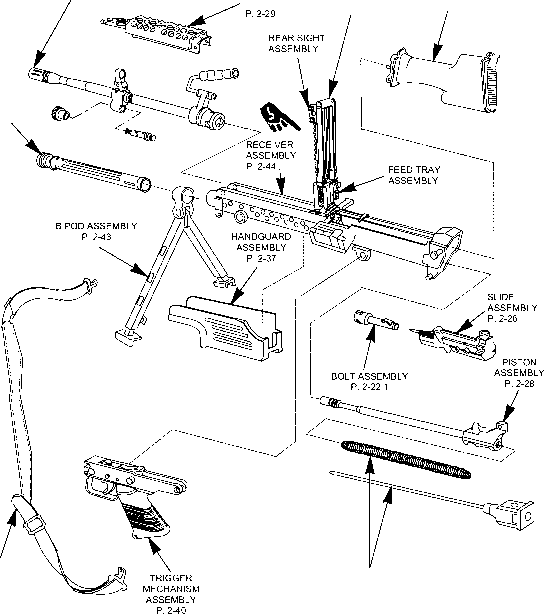 Inspect for spring tension between leg assemblies. 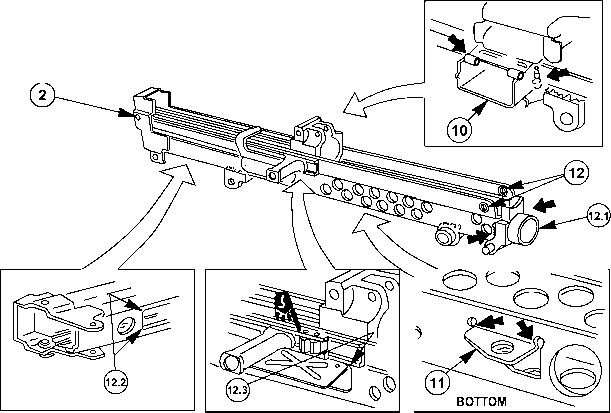 2-21 MAINTENANCE OF RECEIVER ASSEMBLY. 1. 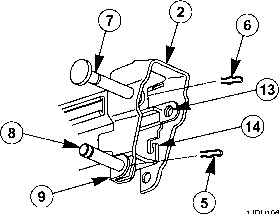 Compress Retaining Clip (1) loose from Receiver (2) and lift Ejector (3) from Receiver (2). 2. Remove Retaining Clip (1) and Cartridge Ejector Pin (4) from Cartridge Ejector (3). Discard Retaining Clip (1). 3. Visually inspect for cracks, bends, or damage. Tip of ejector must be well defined to ensure proper ejection. Cleaning rods can easily damage ejector tips when they are used to assure weapons are cleared on the training ranges. 4. Replace any unserviceable parts. 5. Remove and discard Retaining Clips (5) and (6) from Headed, Grooved Pin (7) and Grooved Pin (8) on rear portion of Receiver Assembly (2). 6. Remove Headed, Grooved Pin (7) from Receiver Assembly (2). 7. 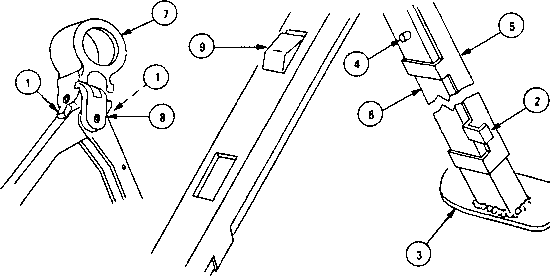 Remove Grooved Pin (8) and Retaining Clip (9) from Receiver Assembly (2). 8. Visually inspect parts for cracks, breaks or burrs. Replace all unserviceable parts. a. Inspect for cracks in welds around Magazine Sleeve (10) both sides. b. Inspect for cracked, bent or missing Handguard Tab (11). c. Inspect for cracked or broken Sling Holes (12), both sides. d. Inspect for cracks in welds of Gas Cylinder Support (12.1), both sides. e. Inspect for cracks in the rear radii of the Trigger Mechanism Slot (12.2) on the bottom of the receiver. f. Inspect for cracks in the Upper Front Radius (12.3) on the ejection port cut out. g. Inspect for elongation and cracks of the Take Down Pin Hole (13) in the inner rail, at the rear of the receiver, both sides. h. Inspect for cracked or bent Transfer Mechanism Assembly Catches/Hooks (14) inside the receiver, both sides. 2-21. MAINTENANCE OF RECEIVER ASSEMBLY (Cont). | i. Inspect for loose cocking handle stop (NEW Style). Inspect for cracks in the radii (just forward of the stop) of the cocking handle channel. Cover and Feed Mechanism Assembly shown removed for clarity. a. Inspect for bent pivot/trigger mechanism flanges on bottom rear of receiver, both sides. b. Inspect for damaged or bent rails by charging and clearing the weapon to detect if binding occurs. Flanges shown exaggerated for clarity. a. Inspect for separation of cocking handle channel from the receiver side wall. b. Inspect the upper rail of the cocking handle channel for a bulge just rear of the cocking handle stop. c. Inspect for worn rails and for presence of notches created by a machining cleanup of excess weld material at new manufacture. 12. 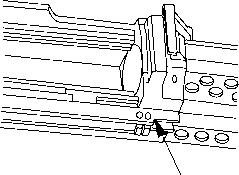 Inspect for damaged/bent magazine dovetails on the bottom of the receiver.